Get ready to experience the thrill of a lifetime! Enjoy the ultimate experience for hardened thrill-seekers with Skymax and raise money for Retina UK! You will be strapped to a 1940s Boeing Stearman biplane, and flown by some of the best display pilots in the UK. All flights are approved by the UK Civil Aviation Authority, there’s a spectator area for friends and family to watch, and you can also have a HD video made (additional cost involved). Skymax is based inside the M25, 5 minutes from Upminster tube and rail and is a great way to get involved in an extreme challenge for Retina UK! The wing walking season is April- Mid October. Pay the fees yourself and raise as much as you can for Retina UK (£395 Tuesday-Thursday, £420 Friday-Sunday). Pledge to raise a minimum of £1000 for Retina UK. 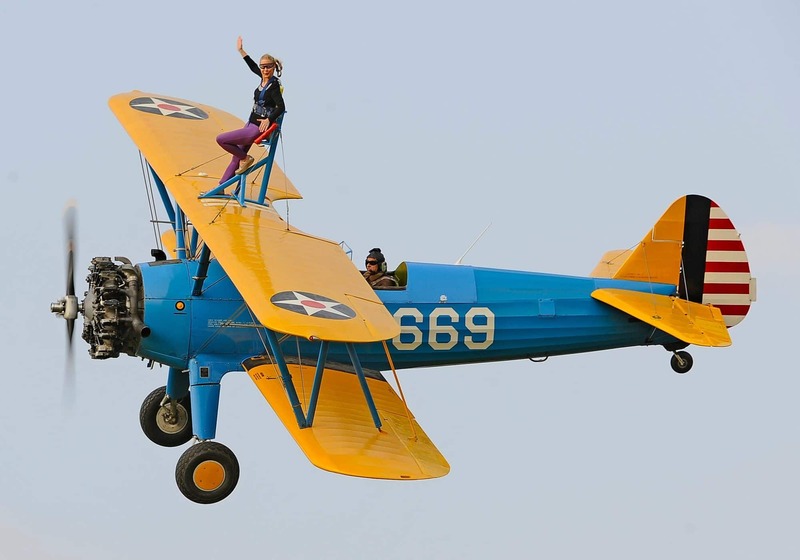 To book your wing walk, please contact Jessica Richards at Skymax on 07522 944798 or email jess@skymax.co.uk. If you have any other questions please contact Emily on 01280 815900 or email fundraising@RetinaUK.org.uk. Maximum age 65 – if anyone above the age of 65 wishes to wing walk we ask that their doctor signs our medical declaration form and that the participant comes to the airfield before they book, to have a go at climbing onto the wing of the plane. This is because climbing onto the wing can be physically challenging and we want to avoid disappointment if they book, raise sponsorship and cannot climb up on the day of the flight. Maximum weight 12 stone 2lb (77kg) – all wing walkers will be weighed on the day before their safety briefing. Sign a medical declaration and an acknowledgement to say that they understand the risks associated with wing walking. Skymax fully insured with £10 million combined third party and passenger liability.